Description: Two Ns units pull a merchandise train through CP Laurel on the NS Reading Line. Description: Norfolk Southern westbound intermodal train 25K, with NS 9909 & 9405, head towards the signas a CP 285, in Northwood, Oh., as a nice patch of sun, rolls in between the storm clouds, as a UP lead train is in the siding. Description: A coal train with NS power passes milepost 538 at 11:10AM. 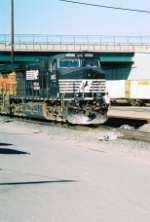 Description: CP runthrough train passing the Triple Crown facility at the east end of Rutherford yard. Description: CP runthrough train passing CP Beaver heading east on the Harrisburg mainline. Description: 410 heading South at MP576. 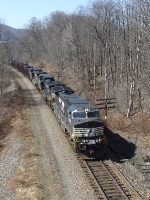 Description: Westbound on the single with a CSX widecab trailing. This was taken in my truck as I wasa getting ready to leave. Description: This CSX leads a rare L42 with front & back units onto the NS Marion Branch. 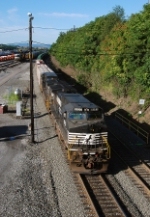 Description: The NS 9405 is the third unit on the rear end on L42. Description: A pair of CSX and a NS engines is on the west or North end of L-42 to be dropped off at Indian Creek near Anderson on the Marion Branch. Description: NS 9332 leads a trio of NS engines as 56A grain train on the Redkey track before backing onto the Marion Branch. Description: 56A, grain train, heads east on the Goodman Industrial Track at the Nebraska Street overpass. The open area to the left of the overpass is where the other part of the double track line was. Description: NS 9405 leads on the Southern Tier line thru Darien NY. Notice the telegragh poles and insulators. Description: An eastbound mixed freight stops at CP Rose for a crew change.